Styling a Game-Day Dipping Platter. I am working on my menu for next Sunday – the ultimate day of snacking is in my sights and I love to be ready with all of the tastiest bites I can think up! 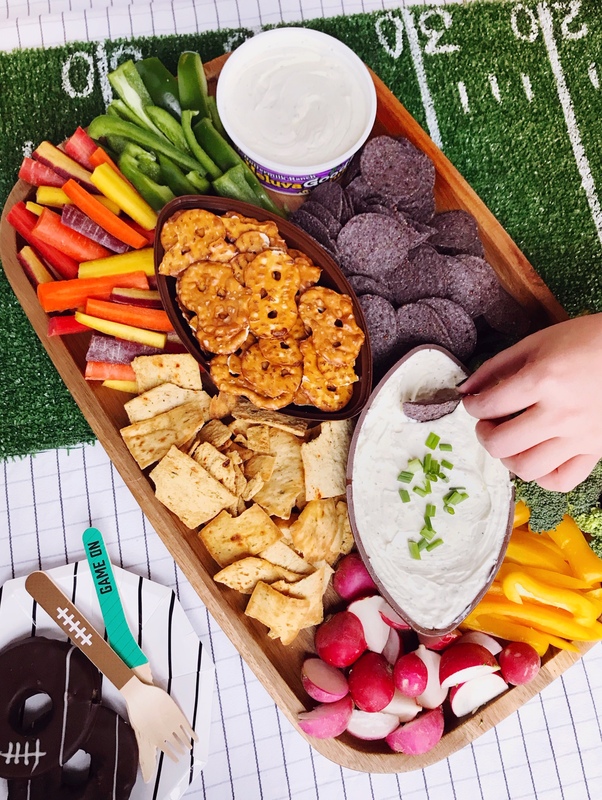 No game day is complete without dip on the menu – and I love to make a giant snack board with all of the fixings for dipping on Sundays. 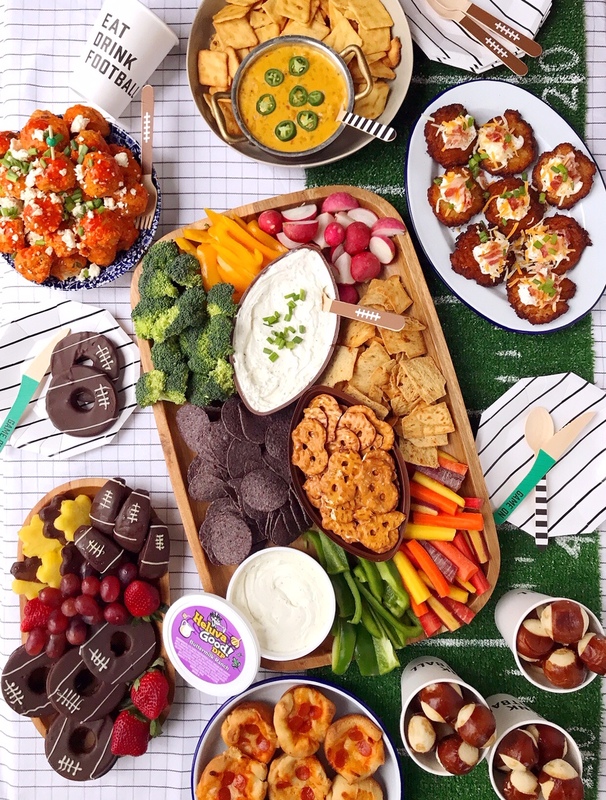 I have a few tricks for how I style these grazing boards, and wanted to share some of my best tips with you so you can recreate them at home for your own football parties! 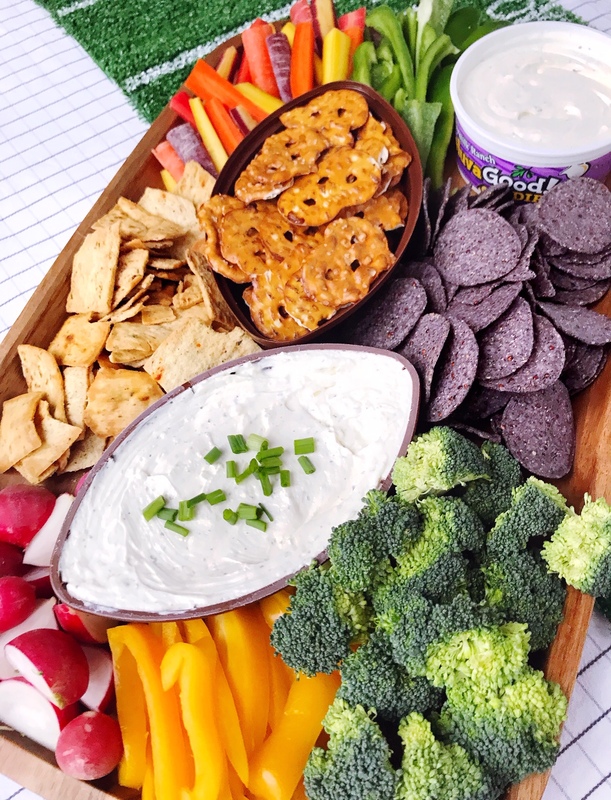 My first item on a big snack board is the dip – my go-to flavors are Heluva Good! Buttermilk Ranch, and Heluva Good! French Onion. They’re both delicious, bold-flavored dips that are perfectly rich and creamy for all of your favorite dippables. I love how they work well with everything from veggie slices to chips and pretzels. I think they’re even perfect for wings or chicken tenders, and I’ve used them as dipping sauces for meatballs too! They’re a family favorite at our house, if I put out this tray on our ottoman, Jane will park herself in front of it and double-dip the same carrot repeatedly until one of us jumps in and replaces it with a fresh one, ha! Heluva Good! 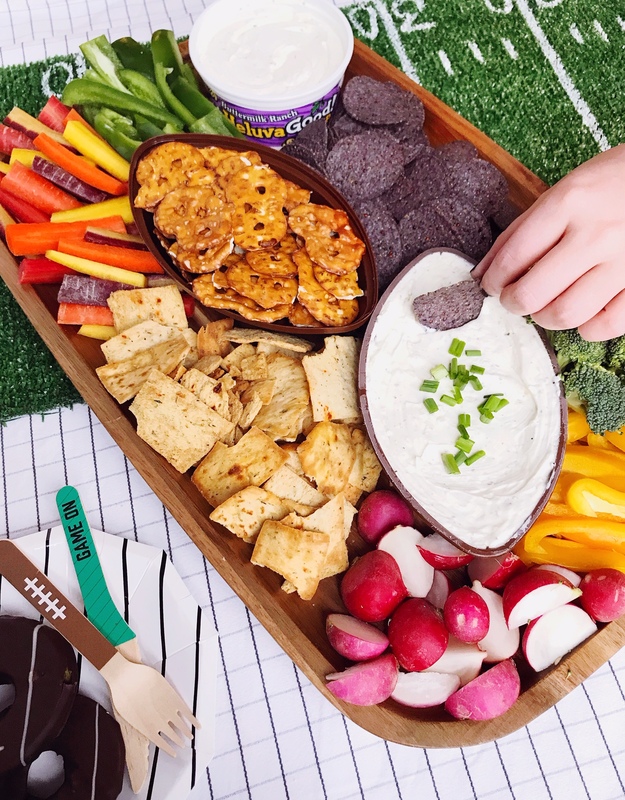 conducted a Big Game Snacking Survey this year and found that 11% of Americans say dip being too tasty is a perfectly acceptable excuse for double dipping, and I have to admit, Jane may get her double-dipping skills from me (shh!) I start my board styling with the dip bowls because they anchor the rest of the snacks that I will arrange around them. For this year’s tray, I picked up Heluva Good!’s limited edition FootBowl, a football-shaped serving container (it’s available now for the Super Bowl in the Northeast region!). I love when I can add in themed elements to a styled dish, and the FootBowl is so cute – it comes with Heluva Good! French Onion Dip on one side, and the top can be used on the board to hold dippable snacks like pretzels or chips! We took it for a test run during last week’s football game and I’m reusing it for future football snack spreads. After my dips are in place I like to start filling in with cut veggies. If you’re not as relaxed about double dipping at your house, I recommend making sure you slice all of your veggies in small two-bite sizes (watch out for things like broccoli florets that might be too large for a bite after dipping). I always try to alternate warm and cooler colors on the board; pairing greens with warmer tones from carrots and peppers. Alternating textures is another way to create visual interest on board like this – I place veggies with round shapes like radishes or tomatoes next to longer pieces like carrot sticks or pepper slices. After your veggies are placed on the board, fill in the negative space with a variety of crunchy dippables like pretzels and chips. I like to pair a variety of textures and colors on the board – blue corn tortilla chips are great for color, veggie-flecked pita chips have beautiful texture and color, and pretzels are always a salty fan-favorite. 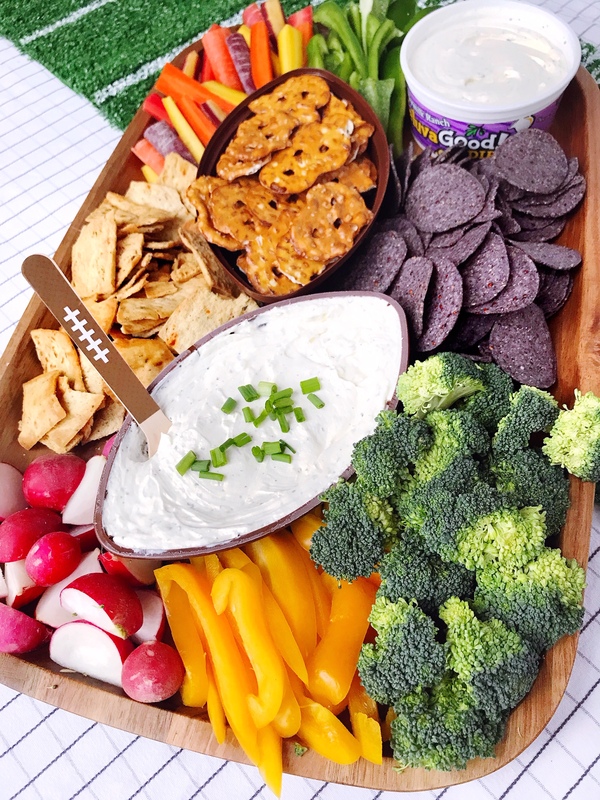 Mixing chips and other crunchy items in on the same board as the vegetables gives it a robust look and saves on space if you’re limited to serving on a coffee table in front of the TV! I keep extra ingredients on hand in their bags nearby to replenish the board as people start snacking. 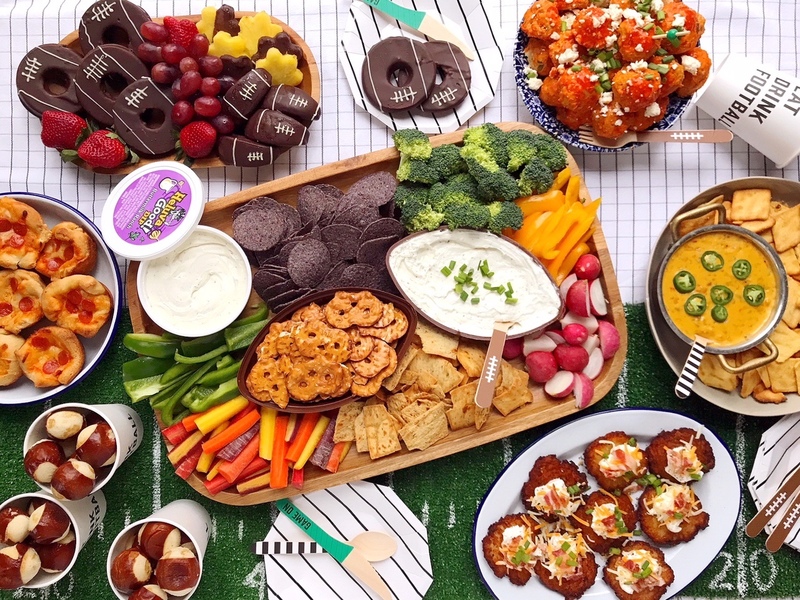 Once you have all of your dippables arranged on your platter, add a final garnish with some fresh chopped herbs and get a good spot on the couch in front of the snacks (and you know, the football game too). Please note: This post was created in partnership with Heluva Good! dips. All opinions, images and content are my own. Thank you for supporting brands that support this site. Pepperoni Pizza Muffins. Green Chili Corn Queso Dip.